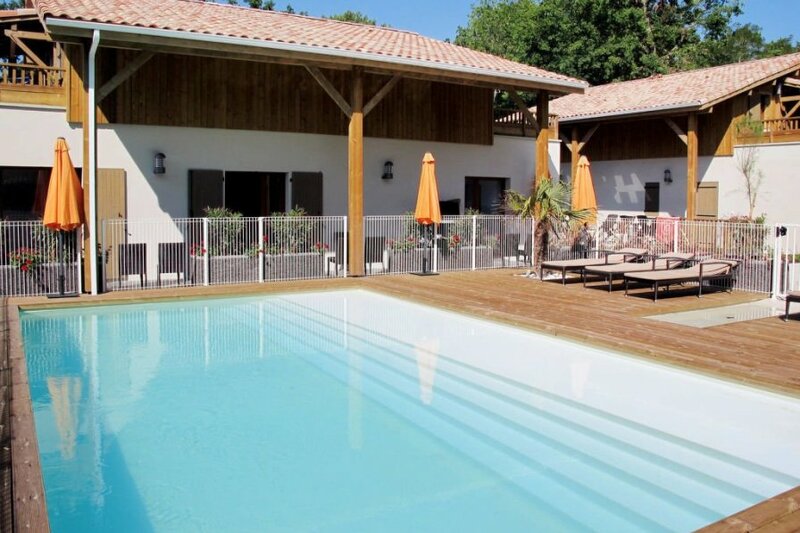 This 1 bedroom apartment with swimming pool is located in Lacanau and sleeps 4 people. It has WiFi. The apartment is within walking distance of a beach. Apartment, 2 - 4 people, 2 room/s, 1 bedroom/s, 1 bathroom/s, approximately 37 m², 1 floor/s, apartment on ground floor or upper floor, year of construction 2011. Feature: Property in a holiday complex (11 building(s) in total, 37 units in total). Furnishing: holiday standard, good, tiled floor, laminate floor. Final cleaning by tenants or against payment, € 50(the kitchenette must be cleaned by tenants in any case). Holiday resort tax. Linen/towels must be brought along. Towels available on loan, € 9 per person/​week (on order). Bed linen available on loan, € 12 per single bed/​week, € 16 per double bed/​week (on order). Deposit € 300 (in cash or by credit card, Visacard, Mastercard). Cot/​High chair free of charge (on request). Pet 1 pet allowed, € 10 per day or € 46 per week (please advise prior to arrival; additional animals on request only). Pool (shared use): 9.0 x 6.0 m, 1.20 m deep, 30/03/19-21/09/19, depending on the weather, heated. Pool area: wood terrace, deck chairs (depending on availability). Infrastructure: bakery service; washing machine (shared use, payment); dryer for shared use (payment); internet access Wi-Fi (included) in the reception area. Important information: Access to the sauna, steam bath and jacuzzi permitted from age 18 only. Plot description: terrace or balcony (partially roofed), furnishing provided. The agent describes this apartment as an ideal holiday rental for the summer holidays. It is also good value for money. This apartment is located in Lacanau. The nearest airport is 53km away. It is set in a convenient location, just 0 metres away from a beach and 6km away from the city center.